Why Are Wine Glasses Different For White And Red Wine? 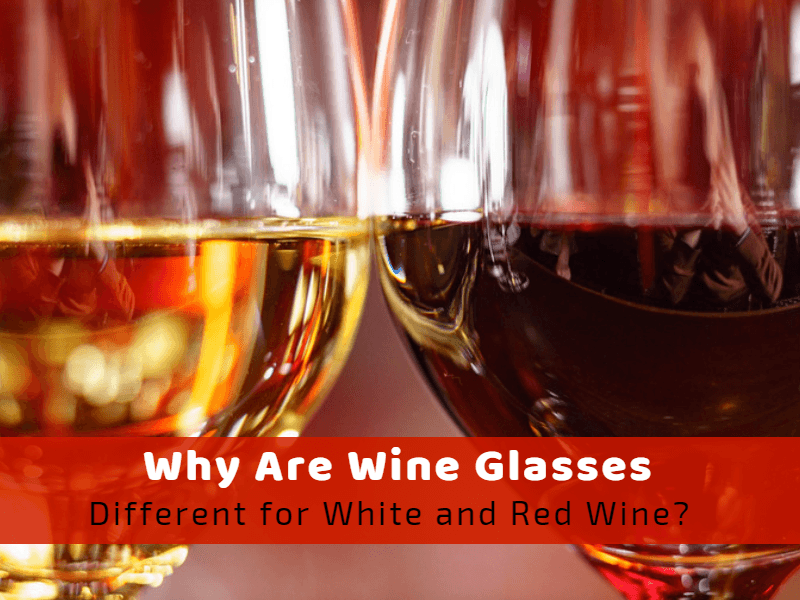 >> Why Are Wine Glasses Different For White And Red Wine? If you are not a wine aficionado, you probably are wondering what is so essential about wine glasses, aren't they just like any other drinking vessel? What does a glass got to do with the wine itself? Why are wine glasses different for white and red wine? While most people do not certainly pay much attentiveness to what they use when taking drinks, wine takers particularly have a different view as far as wine is involved. In truth, there is a lot into glassware, and many wine sellers value the differences in the wine glasses as they augment the experience that one obtains from the wine. Why the different wine glasses? Wine taking is all about fineness, the experience, and the perception; therefore, the right vessel brings all the difference. The same way there are assorted knives meant for various purposes. Many wine partisans believe that wine is a heavenly drink and deserves to treated as such. Using proper glassware enables you to enjoy the nuanced heavenly language spoken by the wine. As much as the glasses do not interfere with the flavor or aroma, they are made in various shapes and sizes based on the type of wine they're intended to hold. If you are a red wine fan, your spouse enjoys the white wine, both of you have different tastes and different experiences, and that's why the glasses are typically varied to give each one of you their own personal taste and experience. 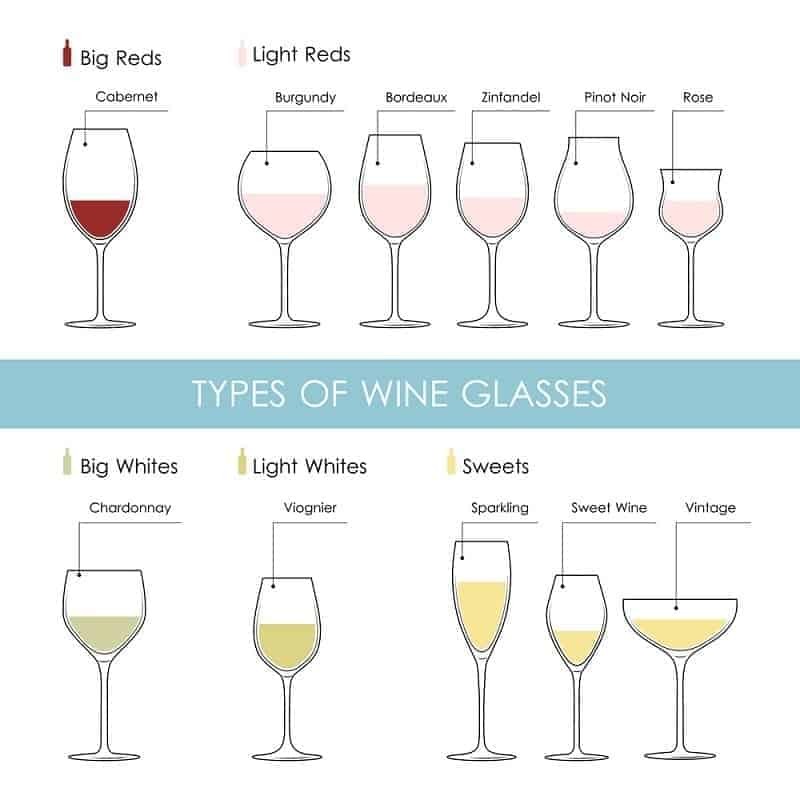 The different size and shapes have different purposes which makes them ideal for the specific type of wine we shall discuss, but to understand the relevance of these glasses to the kind of wine they hold, we must first understand the different parts of the wine glass. The foot: It is the flat bottom part that helps the glass to stay upright. The stem: It is the supporting part that enables you to hold your wine without transmitting any heat from your hands to the wine. It also helps avoid dirtying the glass with oil or food particles after a meal which blocks the visual enjoyment. The bowl: This is an essential part of a wine glass. It is the part that holds the wine and determines the amount. It is also where most variation occurs as the glasses are either tapered with either a narrower opening or a wider bottom. The varying shapes help distribute and capture the wine's aroma and drives it towards the nose and mouth.The bowls are also designed to enable a considerable amount of surface area conducive for the wine. For instance—red wine glasses require a large surface area to allow the wine to breathe and release its scent while white wine glasses need a small surface area. The rim: Winemakers agree that the thinner the rim, the easier it is to sip your wine. A good wine glass will have a cut-like rim with smooth edges that does not inhibit the wine when flowing out and that is soft enough for your lips and mouth. Rims can be particularly distractive despite the functionality; the rolled or bumpy nature can ruin your wine experience. Color: While most glasses are crystal clear, colored glasses especially with decorative accents also exists and offer quite an outstanding appearance. However, clear glasses are more recommend as they allow the scarlet color and the whole subtleties of the wine to be visible. In wine taking nothing is taken for granted, every aspect is looked into with utmost keeness. Wine glasses take multiple forms and shapes for different reasons. The modern society today operates on quite varying parameters. For instance, wide bowl-shaped glasses are used in red wines not just for the aromatic effects but because they give you that comfort when swirling the liquids in them. Mind you, the most predominant reason for choosing a Pinot Noir glass shape, a red wine glass shape, a chardonnay glass shape, a white wine glass shape or simply name-your-variety glass shape is that it changes how you perceive your wine. From its color, body, and alcohol to its acidity and tannins. More elegant wine styles, grape varieties, and lighter wine tend to gain an advantage than their other counterparts. More powerful and full-bodied flavored wines typically enjoy their superiority in bigger rounder glasses. The term larger and smaller are relatives. Many of those breathtaking red glasses you see in big expensive restaurants tables today are capable of holding about a whole bottle of wine. However, not all wine can dance up to the breathability portrayed of those 20 pulses or so ounce glasses. Take up some solace knowing that you could adopt the Universal glasses that virtually works well for your taste. A Bordeaux style glass, for instance, is about 8.75 inches tall and 3. 3 inches in diameter. The glass could hold about 15.75 ounces that is approximately 62 percent of the whole bottle if one was to fill the glass to the brim. Well, of course, the glass can only be filled to about one third, which is 5 ounces and about one-fifth of the whole bottle. Red wine commands larger wine glasses. The bowls of these types of glasses tend to be fuller and rounder with a larger opening compared to white wine glasses. If you’re the sniffy type, you can practically dip your nose into the glass to get the aroma or just enjoy it every time you are taking a sip. The large bowl allows the red wine aromas to escape freely and create a red -wine atmosphere. It is also imperative for the bowl to be large as it allows air to come into contact with the wine, which contributes to the beautiful coloring of the wine. Typically, it turns darker as it combines with the air. Red wine glasses can also be tall as long as they maintain the bowl large and round. The Bordeaux glass is one example of the taller glasses. It is designed to hold heavy, full-bodied red wines like Merlots and Cabernets. The tallness of the glass makes it possible for the wine to roll down straight to the back of the mouth and maximize its flavor. Another famous glass is the burgundy glass that is designed to hold lighter wines like pinot noir. It is similarly tall just like Bordeaux glass but has a larger bowl compared to Bordeaux glass. This is to help direct the wine to the tip of the tongue and get the taste of the delicate flavors. Generally, most red wine glasses are a bit taller but have a larger bowl compared to white wine. The design is meant to create aeration, allowing you to enjoy the nuances of fine wine and the subtle complexities of the wine. Away from the nose, the design of the wine glass also determines how the wine hits your palate. Like the burgundy, glasses allow the wine to fill more of the palate while Bordeaux glasses will ensure that the wine focuses on the palate center. That is because red wine has a characteristic of showcasing better if certain parts of the tongue are touched. They also direct how and where we detect sweetness, acidity, and tannins. Red wine glasses are not made for shows; they are prepared to serve some several essential minutes. The short stem does not define much on where the wine taker should hold, for a more comfortable and firmer grip, the holder can hold both the stem and the bowl together. Even if the drinker holds the bowl of the glass, their warm hands do not affect the temperature of the drink, the aroma and flavor in any way. These types of glasses are more of u-shaped and relatively upright than those of red wine. White wines like to remain cool that is why the wine partisan should hold the glass through the step at all times. It is the same reason why they have a small round brim that encloses the wine to prevent it from interacting with air. Unlike red wines, white wines do not need any air and are not enhanced by oxidation, so there is no need to keep them aerated. The narrow glass shape helps reduce the surface area of the wine which comes into close contact with oxygen. The narrow brim also has another function of allowing you to sniff on the wine without directly coming into contact with it or attracting too much air towards it. The delicate aromas also deserve some enclosed vessel. A great example of a white wine glass is Chardonnay, which comes in all styles and shapes, the highly minerally, discreet in fruity and boldly tropical in fruit and loads of toasty oak nuances. Older forms of Chardonnay used to give a better taste to white wine with the small white wine glasses. However, the new styles also perform better. The Riesling glass is another great glass with a wide range of bountiful as well as aromatic expressions. Its exuberance is not natural to contain, and so it’s better to serve the drink in smaller glasses as the focus dwells on the bouquet. Unlike Pinot Noir who really appreciates some reasonable amounts of oxygen, Riesling prefers to keep its floral delicacy intact and can easily find itself lost in a large glass. Due to the chemical variances, there are very few white wines that can significantly improve through aeration compared to red wine. These kinds of chemical differences are the reasons why white wine is served chilled or slightly cooler than room temperature, which helps generate the absolute concentrations of the unique phenolic compound present in these varieties. To achieve the perfect white wine experience, get an average sized glass with a relatively small globe. White wine is typically served in the same tight tulip which is ideal for holding and also capturing the desired aromas done through the gap between the lip of the glass and the wine. Since oxidation is not a pre-eminence when it comes to the whites, the small liquid surface area can go a long way towards keeping the contents together which only means that the wine tastes better for longer. It is quite clear that the wine glasses do not necessarily mean the shape and size. There is more into it than just the physical appearances. Glass manufactures paid utmost attention to both wines before creatively crafting the glasses. Typically, each glass defines the type of wine it holds. Red wine glasses which appear more bulbous have a wide brim and short stem compared to their white wine counterparts. Even though you’re traditionally expected to serve less wine in a red wine glass than white wine, the large round bowls allow swirling of the drink in case of a toss with friends and also let the flavors and beautiful scents to spread into the air. There is also a remarkable undeniable relationship between red wine and atmosphere. Oxygen deepens and darkens the red color while also enhancing the taste of the wine. Since red wine is served at room temperature, it is easy for oxidation to take place and the chemical reaction to be visible. White wine, on the other hand, is quite the opposite of red wine. In most cases, white wine is served chilled. The narrow glass is meant to conceal the aroma and preserve the drink away from air. Some of the flavors from white wine are implicitly precarious and requires no high temperatures nor too much exposure to the air, so that type of glass keeps it colder and fresher for longer. White wine glasses also come with longer stems to ensure that the holder only holds at the stem. This is to keep the warm hands away from the wine itself incase they interfere with the quality of the wine. Red wines are customarily served at room temperature and consequently do not require the long stem to hold and the wine taker can, therefore, hold from wherever they deem appropriate.